Coug Senior Interns in Washington D.C.
Over the summer, Cherrise Reyes, a senior at WSU from the Upper Skagit tribe, participated in the Native American Political Leadership Program in Washington, D.C. As part of the program she was able to attend the Democratic National Convention, where she was present for Michelle Obama and Senator Bernie Sanders’ speeches. 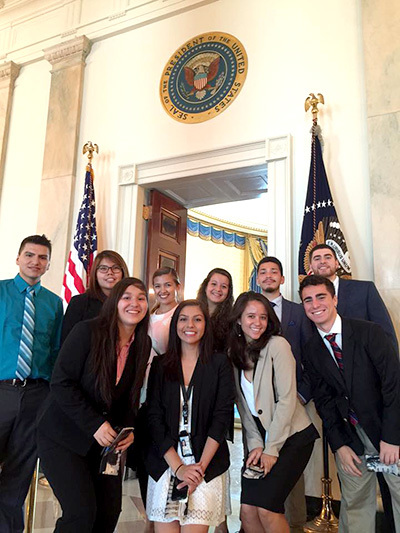 Cherrise Reyes (center) with other interns on a tour of the White House. As part of the program, Reyes attended classes at George Washington University, where she studied political management, and campaigning. Also, she worked 30 hours a week interning with Indian Affairs for the Office of Self-Governance. Reyes said that the first day, she was both nervous and excited. She explained that she wasn’t exactly sure what to expect. “I’ve always been good at adapting, so I think I adjusted well,” Reyes said. Her job included a lot of record keeping, drafting, dealing with legal documents, and having to pay attention to detail, which she explained was good practice for a career in law. Reyes is majoring in political science with an emphasis in pre-law, and minoring in criminal justice. She said that after the program, she now has a better idea as to where she wants to go to law school and feels more prepared for her professional career. In D.C., Reyes met a law student that goes to University of Arizona (U of A), which is one of the locations Reyes is considering for law school. She explained that the student is a member of Alpha Phi Omega Native American sorority at U of A, something she was excited about because she’s trying to start up a chapter for the same sorority at WSU. In addition to networking with other law students, grad students and professionals in the field, Reyes also had the opportunity to meet an FBI agent and tour their facilities. “I have never networked so much in my life,” Reyes said. The program put a huge focus on professional development, they even gave Reyes business cards to hand out. Reyes did save some time to explore the city and have fun in D.C. She toured two Smithsonian buildings: the Space Museum and the National Art Gallery. She also went to the National Museum of the American Indian on multiple occasions. She was able to be present when the Cherokee Nation was opening their exhibit at NMAI with their tribal council and some royalty present for a ceremony complete with traditional foods. She went to a bunch of different types of restaurants, her favorite being a Portuguese rotisserie chicken restaurant. She didn’t get the full experience of eating from a food truck though. Reyes didn’t just spend the whole time in D.C. The program arranged for her to attend the Democratic National Convention at the Wells Fargo Center in Philadelphia. She explained that the program only had a certain number of passes to get into the convention, so it was up to the interns to network and get in. She met and volunteered with the Native Council, and they pulled out her name when drawing for one of the passes. She didn’t get to go on Wednesday when President Obama spoke, but she did go on Tuesday for Bill Clinton, and on Thursday for presidential candidate Hillary Clinton. She found that the east coast and the west coast are vastly different. She is very appreciative of the fact that she was accepted to the program and given the opportunity to live in that region of the country and be exposed to a different culture.